It works fine with Mitogen 0.2.2; it fails with 0.2.4, whether the security group already exists or not. Somehow explicit localhost's python_path has been broken. To confirm, do you have 'localhost' listed explicitly in your inventory? I see here by removing it (and receiving the default implicit localhost Ansible provides), the problem disappears. This is almost certainly due to the python_path changes done during the delegate_to fiasco. Since you asked on #511, I tried your suggestion there; neither of -e ansible_python_interpreter=python nor -e ansible_python_interpreter=/usr/bin/python change the behavior for me. Does the default localhost go via SSH rather than local? 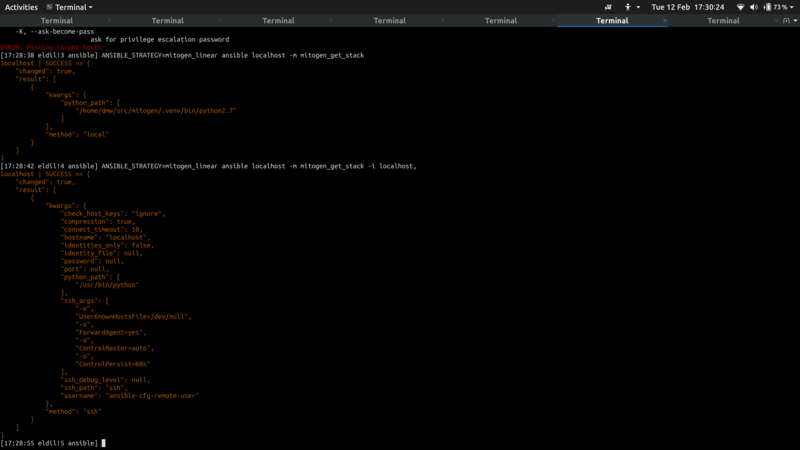 The implicit localhost gets ansible_connection=local and ansible_python_interpreter=[sys.executable], if you define it in inventory, it's just another host -- so ansible.cfg's transport setting by default, and IIRC just python or /usr/bin/python for ansible_python_interpreter. since verifying implicit localhost behaviour is important. happened. It was always incorrect. Hm, I tried this with master just now (5c5e9fb), and my playbook above still fails, same error. This diagnosis method is new in 0.2.4, so it won't work with 0.2.2 or 0.2.3. It will list a "method" and "python_path". For implicit localhost, it will be method "local" and the same Python interpreter as was used to run Ansible -- maybe from a virtualenv. For explicit localhost, it would have "python_path" == "/usr/bin/python" by default, and "method" "ssh" by default. Please download the raw version of https://github.com/dw/mitogen/raw/master/tests/ansible/lib/modules/custom_python_detect_environment.py and save it in a new subdirectory. The output of this module will contain a sys_executable key, and also a python_path key. You can compare the output of those keys with the same module run under vanilla -- just drop the ANSIBLE_STRATEGY from the command line. the ModuleResponder cache with our 2.4-compatible version. remove it from the whitelist if a local 'json' module import succeeds. My reproducer now works fine with master. Thanks!